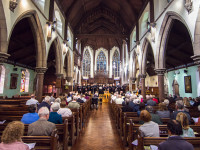 Liverpool Bach Collective was formed in 2013, with the aim of putting on performances of J.S. Bach's cantatas in churches around Liverpool every month as part of Sunday Evensong or Vespers. The cantatas chosen are based on, or at least relevant to, the readings of the day in the churches visited. 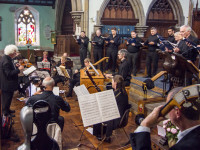 The Collective consists of eight singers and an ensemble of around twelve instrumentalists, usually strings, oboes and organ; the ensemble is enlarged when the music demands it. 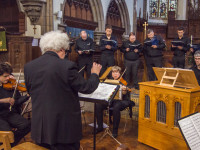 The performers are a mix of professional, semi-professional and amateur musicians, and the Collective is directed by Philip Duffy, formerly Master of the Music at Liverpool's Metropolitan Cathedral. 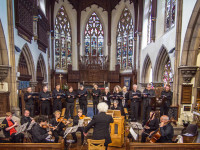 The singers and players all have a love for the music of Bach and are committed to performing these wonderful works. 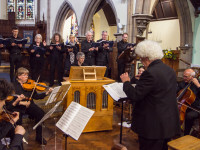 By the end of the current season, 35 cantatas will have been performed in twenty four different churches, from Hightown to Rainhill and Ince Blundell to Birkenhead. The ensemble continues to enlarge its following of interested listeners. The Collective has its own continuo organ, specially built for it by master organ builder Gyula Vagy in Budapest in 2015. The organ has three ranks of pipes, two of wood (Gedackt 8' and Floete 4') and one of metal (Ocktav 2'). The case is made from cherry wood, the keyboard is plum, and the wooden pipes are made from maple.